Basically, you can get anything in New York City. And I don’t think I can. ever. leave. Tramezzini– Simple Tuscan beach/picnic sandwiches on spongy, crustless white bread. My favorite is chopped egg and tuna. Takoyaki– Japanese puffed pancake balls stuffed with octopus and topped with mayo, Worcestershire sauce, and bonito. Acaraje– Brazilian black bean fritters stuffed with baby shrimp and pico de gallo (via nymag.com). Vietnamese Crepe– A big, crispy yellow pancake filled with bean sprouts, shrimp, and sometimes pork; served with lettuce, mint sprigs, cukes and vinegary dipping sauce. Lahmacun– Turkish spicy lamb pizza served with fresh sprigs of parsley and lemon. Whitebait– Fried, french-fry-sized tiny fish, eaten whole with dipping sauce. I originally searched for Marithes, the Greek version, but Menupages is weak on Queens. Elotes– Mexican grilled corn cup with lime, cotija and chili powder. Served hot, and oh-so comforting. Poutine– Fries with cheese curds and gravy. From Canada, with oat a doat. Festival– Jamaican deep fried cornmeal breadstick. Eaten alongside Jerk Chicken or alone with ketchup. I like both! Pierogi– Polish filled dumplings. My favorite are mushroom and sauerkraut, but I usually just get them from my local Brooklyn supermarket and eat cold. Taiyaki– Black bean filled crispy pancakes in the shape of a fish that I was obsessed with in Singapore. This goes beyond Menupages. What are your favorites? Have you found them? Today I met Ashanti for lunch at a place called Spoon on West 20th Street. She works nearby and goes there almost every day. Like Grey Dog, the menu is coffee/sandwich/salad centered, which made my heart sink when I first walked in (see that post for why), but one glimpse of the goodies behind the glass at the front counter perked me back up. We each started out with a strong drink (iced coffee for Ashanti, and verbena mint tea for me) and two squares of gruyere pizza with oven dried tomatoes and herbs. The pizza was amazing even though it was “cold pizza” a.k.a. served room temperature. You know, I don’t really have a problem with cold pizza. It reminds me of my first coed sleepover, and how it helped me recover from the trauma of watching my sister kiss a boy for the first time playing spin the bottle. Comfort food! Ashanti and I had a lot to talk about, and by the time we devoured our pizza, plus a delectable green tea pot de creme with peanut tuile we’d picked out on impulse, we realized–30 minutes into our lunch date–that we’d not yet had a proper meal. So Ashanti went back to the line to order us up something meaty. Meanwhile, I admired the steel blue, cream and robin’s egg accented interior of the place, softly lit with low hanging frosted glass fixtures and mirrors. All of the tables were vintage, and at the center of each one was a Mason jar filled with fresh white and lavender mums. Considering that the prices here are comparable to most quickie [read dreary] Manhattan lunch spots…$8 sandwiches, $4 soups…I’d say these are some pretty nice perks. Ashanti returned with a tray of herb roasted chicken, mashed potatoes & cabbage, and a slice each of roasted acorn squash, portobello mushroom and braised leek, for us to share. The chicken was perfectly seasoned and juicy, like a home roasted chicken, and the vegetables were a hearty enough (for lunch) accompaniment. On our way out, I saw Audrea’s sister, Melissa. She had walked all the way over from her job on Lexington just to get their roasted portobello sandwich. I think Spoon’s focus on fresh, local ingredients has a lot to do with their popularity right now, but basically, the food just tastes good. 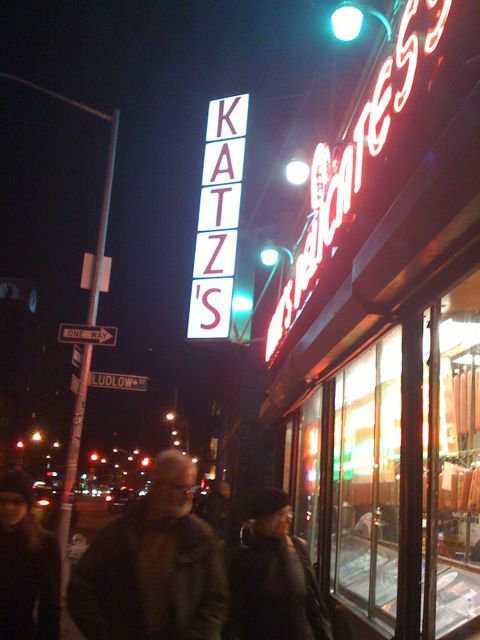 We all know how buttery, succulent, and melt-in-your-mouth good Katz’s pastrami is. But did you know that the same goes for their salmon? I found that out tonight, sneaking bites of my boyfriend’s sandwich between slurps of my matzoh ball soup. Just like the pastrami, their salmon was served simply- sliced thick and piled high between slices of rye bread. This was lox like I’ve never had it before; bright pink throughout, with not a trace of gray or purple, zero fishiness, and nothing but a smear of brown mustard for topping. So grab your favorite pescatarian. It’s big sangwich time! I met Audrea for lunch at Grey Dog Coffee, a newish place by Union Square. I have to say that it is hard for me to like these coffee/sandwich/salad places becaust that’s the kind of food we make at my job, but it was good. 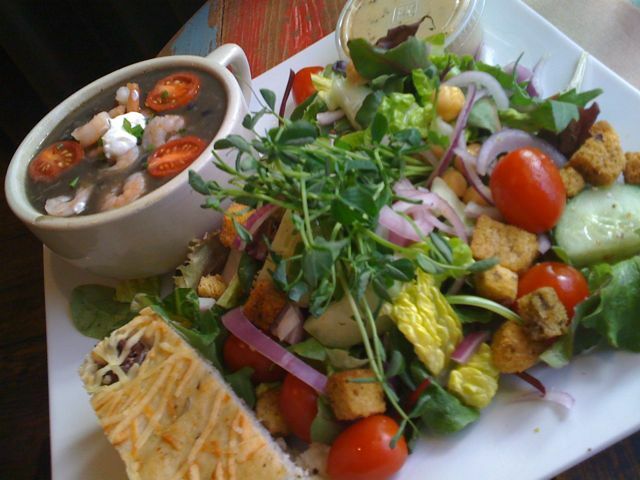 I ordered the black bean soup with shrimp and a salad. It was around $14… Not cheap for lunch but a lot of food. Bonus points for the laid-back, conversation-friendly atmosphere. UPDATE: Based on my above experience, I went back to Grey Dog for dinner last night. I ordered the steak and palm salad, because I’d just gone to the gym and needed protein without a lot of carbs or fat. Steak salad: in my experience, this means a piece of grilled beef, sliced and served over some greens and whatever else they want to throw in. Oh boy. This was so wrong. My advice: Lose the flavorless palm hearts. Lose the hunk of bread, and the parmesan. Get some real meat. It doesn’t have to be fancy. I know times are tough, but for $14.00, real meat would be nice. And a note for vegetarians and vegans, the “veggie” chili is laced with sliced yellow cheese. I also don’t recommend ordering it for dinner. Since my bf couldn’t eat it, I had a bite and couldn’t get past the burned flavor, which probably comes from sitting in a warmer all day long. My big news for the day: I finally mastered Brioche! And they were beautiful, buttery babies. The recipe was from a Jacques Pepin party cookbook, which I selected for authenticity and because the recipe included booze. (The stuff all good pastries are made of.) But I left work in such a hurry that pictures and recipe will have to wait for tomorrow. Another recipe coming soon will be olive oil + rosemary brioche. Since the holidays, I have really fallen for my Veganomicon cookbook. Isa, the author, is really amazing and creative with replacing dairy. I have already tried her recipes for Cashew Ricotta, Walnut-Mushroom Pate, Cucumber Cashew Dip (like tzadziki), and Zuchhini Tomato Pancakes. All were amazing. SO today, while perusing my already splattered copy of the big book over a bowl of puffed wheat and soymilk, I dreamed up a dairy-free brioche made with really good extra virgin olive oil instead of butter. Then I thought about the rosemary-studded table bread I used to sneak from the stash in the kitchen at P*ong. I think the combination would make a sublime breakfast food. Stay tuned! Tonight I took a break from my working weekend to see my friend Gary in a hilarious play called The Lesbian Vampires of Sodom. His costume changes, including gold lamé gladiator skirt, bicycle short with feather boa, and giant afro, were enough to have me rolling in the aisle, but the great acting helped, too. After the show, I was so proud of him, but for some reason, I did not have it in me to go out and celebrate with everyone. Instead, I headed over to this sweet little Japanese teahouse on East 9th Street that I kind of have a crush on right now, for some quiet time and nonalcoholic beverage therapy. Kristen and I discovered Cha-An one chilly night while wandering around 3rd Avenue looking for a place to celebrate her last day of work with good beer (me) AND good tea (her). We checked out a few places but nothing worked for us. Then I noticed this little glowing sign by a doorway. It looked like you had to get buzzed in, but the door swung open when I pulled it, and we climbed up a flight of stairs and ducked through a curtain. It already had all the symptoms of an Anita favorite. The mood inside was warm and dark, and accented with wood and stone. The navy blue smocked waitresses smiled from behind a low bar, where you could look beyond to an all-girl staffed open kitchen. We were seated at a low table and I enjoyed a truly delicious buckwheat soba beer. It was more lively inside this time, and I had to wait for a table. But there was a little stone pillar with a softly glowing window at the top for me to stare at while lounging in the waiting area. The waitress stirred me from my trance and led me to a small table. Jean was on the way, but I couldn’t wait for a bright green matcha latte, which was delivered in a big, beautifully painted earthenware bowl. I wrapped my hands around it, took in some steam, tipped it back, and became just as relaxed as could be. At the bottom of the bowl, there were some tiny red beans. That sent me back twenty years, to my first happy ending sundae from Friendly’s–with the Reese’s Pieces at the bottom. And I felt…HAPPY. Jean arrived and we each ordered a “set,” which turned out to be a multi-course meal of extremely tiny but satisfying dishes. Mine was basically a bowl of multigrain rice porridge with different garnishes, like pickled ume plum (my favorite one) and marinated enoki mushrooms; and some delicate octopus and vegetable fritters. Jean’s included a smoked salmon salad and some soulful-tasting stewed kubocha squash. We gobbled everything up in a very un-teatime-like way, and were rewarded with these two beautiful desserts, which we decided to savor more slowly. Mine was a square of caramel mousse on a dense and gooey chocolate cake base, and Jean’s was a tea flavored mochi stuffed with sweet red beans. We let each other sneak heavenly bites. The whole meal was less than $40, which is a lot for us, but a great value when you consider the quality of the food and the fact that you get amazing tea (with free refills for most brews), and dessert too.